Armored Trooper Votoms: Alone Again is a bit of a weird entry in the already quite weird votoms franchise. After 2010's Phantom Arc was created to finally follow-up 1994's shining heresy and more or less cap off Chirico Cuvie's story, one of Votoms' trademark gaps was created by starting the first episode after Chirico had visited and left his friends already. Alone Again fills in that gap, but also manages to be one of the best entries in the franchise while at it. The story itself is quite short and familiar. Chirico visits his old friends in their Oasis town, but violence looms ahead. Chirico's arrival doesn't exactly do anything to stop that, but it's clear our hero has grown somewhat over the years, and seems to be quite conscious of the fact death and destruction follow wherever he goes. It's this growth that makes Alone Again more interesting, as Chirico manages to show a more matured side of himself without losing his stoic attitude. The CGI has stepped up a little from Phantom Arc again, but it's nothing more than just serviceable. Seeing scopedogs zip around the desert won't get boring anytime soon, but there's still some residual clunkiness in the way the fights are portrayed. What makes Alone Again shine is the ending. It somewhat redeems a bad character while tying a more satisfying and fitting thematic end to the story than Phantom Arc did, ending on a balance that implies a better continuation than we already know is actually coming. 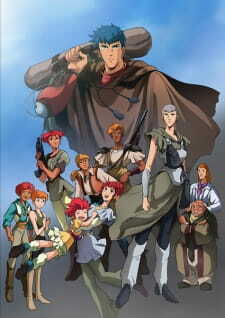 It's the best way for Chirico Cuvie's story to end, and for him to move on from the past. Armored Trooper Votoms: Alone Again is really made for a small niche of fans who have already watched Phantom Arc and were either wondering what happened beforehand or wanted an ending more in line with what we have come to know as Votoms. It manages this, but for a few brief minutes also reaches a peak higher than the franchise has ever achieved before.